Not to be confused with Lectin. Lecithin (UK: /ˈlɛsɪθɪn/, US: /ˈlɛsəθɪn/, from the Greek lekithos, "egg yolk") is a generic term to designate any group of yellow-brownish fatty substances occurring in animal and plant tissues, which are amphiphilic – they attract both water and fatty substances (and so are both hydrophilic and lipophilic), and are used for smoothing food textures, emulsifying, homogenizing liquid mixtures, and repelling sticking materials. Lecithins are mixtures of glycerophospholipids including phosphatidylcholine, phosphatidylethanolamine, phosphatidylinositol, phosphatidylserine, and phosphatidic acid. Lecithin was first isolated in 1845 by the French chemist and pharmacist Theodore Gobley. In 1850, he named the phosphatidylcholine lécithine. Gobley originally isolated lecithin from egg yolk—λέκιθος lekithos is "egg yolk" in Ancient Greek—and established the complete chemical formula of phosphatidylcholine in 1874; in between, he had demonstrated the presence of lecithin in a variety of biological matters, including venous blood, in human lungs, bile, human brain tissue, fish eggs, fish roe, and chicken and sheep brain. Lecithin can easily be extracted chemically using solvents such as hexane, ethanol, acetone, petroleum ether, benzene, etc., or extraction can be done mechanically. It is usually available from sources such as soybeans, eggs, milk, marine sources, rapeseed, cottonseed, and sunflower. It has low solubility in water, but is an excellent emulsifier. In aqueous solution, its phospholipids can form either liposomes, bilayer sheets, micelles, or lamellar structures, depending on hydration and temperature. This results in a type of surfactant that usually is classified as amphipathic. Lecithin is sold as a food additive and dietary supplement. In cooking, it is sometimes used as an emulsifier and to prevent sticking, for example in nonstick cooking spray. 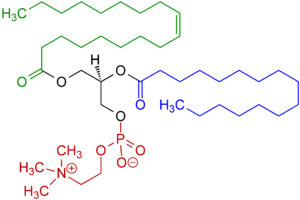 Commercial lecithin, as used by food manufacturers, is a mixture of phospholipids in oil. The lecithin can be obtained by water degumming the extracted oil of seeds. It is a mixture of various phospholipids, and the composition depends on the origin of the lecithin. A major source of lecithin is soybean oil. Because of the EU requirement to declare additions of allergens in foods, in addition to regulations regarding genetically modified crops, a gradual shift to other sources of lecithin (e.g., sunflower lecithin) is taking place. The main phospholipids in lecithin from soya and sunflower are phosphatidyl choline, phosphatidyl inositol, phosphatidyl ethanolamine, phosphatidylserine, and phosphatidic acid. They often are abbreviated to PC, PI, PE, PS and PA, respectively. Purified phospholipids are produced by companies commercially. To modify the performance of lecithin to make it suitable for the product to which it is added, it may be hydrolysed enzymatically. In hydrolysed lecithins, a portion of the phospholipids have one fatty acid removed by phospholipase. Such phospholipids are called lysophospholipids. The most commonly used phospholipase is phospholipase A2, which removes the fatty acid at the C2 position of glycerol. Lecithins may also be modified by a process called fractionation. During this process, lecithin is mixed with an alcohol, usually ethanol. Some phospholipids, such as phosphatidylcholine, have good solubility in ethanol, whereas most other phospholipids do not dissolve well in ethanol. The ethanol is separated from the lecithin sludge, after which the ethanol is removed by evaporation to obtain a phosphatidylcholine-enriched lecithin fraction. As described above, lecithin is highly processed. Therefore, genetically modified (GM) protein or DNA from the original GM crop from which it is derived often is undetectable – in other words, it is not substantially different from lecithin derived from non-GM crops. Nonetheless, consumer concerns about genetically modified food have extended to highly purified derivatives from GM food, such as lecithin. This concern led to policy and regulatory changes in the European Union in 2000, when Commission Regulation (EC) 50/2000 was passed which required labelling of food containing additives derived from GMOs, including lecithin. Because it is nearly impossible to detect the origin of derivatives such as lecithin, the European regulations require those who wish to sell lecithin in Europe to use a meticulous, but essential system of identity preservation (IP). Lecithin has emulsification and lubricant properties, and is a surfactant. It can be totally metabolized (see Inositol) by humans, so is well tolerated by humans and nontoxic when ingested; some other emulsifiers can only be excreted via the kidneys . Lecithin is used for applications in human food, animal feed, pharmaceuticals, paints, and other industrial applications. In the pharmaceutical industry, it acts as a wetting, stabilizing agent and a choline enrichment carrier, helps in emulsifications and encapsulation, and is a good dispersing agent. It can be used in manufacture of intravenous fat infusions and for therapeutic use. In animal feed, it enriches fat and protein and improves pelletization. In the paint industry, it forms protective coatings for surfaces with painting and printing ink, has antioxidant properties, helps as a rust inhibitor, is a colour-intensifying agent, catalyst, conditioning aid modifier, and dispersing aid; it is a good stabilizing and suspending agent, emulsifier, and wetting agent, helps in maintaining uniform mixture of several pigments, helps in grinding of metal oxide pigments, is a spreading and mixing aid, prevents hard settling of pigments, eliminates foam in water-based paints, and helps in fast dispersion of latex-based paints. Lecithin also may be used as a release agent for plastics, an antisludge additive in motor lubricants, an antigumming agent in gasoline, and an emulsifier, spreading agent, and antioxidant in textile, rubber, and other industries. The nontoxicity of lecithin leads to its use with food, as an additive or in food preparation. It is used commercially in foods requiring a natural emulsifier or lubricant. In confectionery, it reduces viscosity, replaces more expensive ingredients, controls sugar crystallization and the flow properties of chocolate, helps in the homogeneous mixing of ingredients, improves shelf life for some products, and can be used as a coating. In emulsions and fat spreads, such as margarines with a high fat content of more than 75%, it stabilizes emulsions, reduces spattering during frying, improves texture of spreads and flavor release. In doughs and bakery, it reduces fat and egg requirements, helps even distribution of ingredients in dough, stabilizes fermentation, increases volume, protects yeast cells in dough when frozen, and acts as a releasing agent to prevent sticking and simplify cleaning. It improves wetting properties of hydrophilic powders (e.g., low-fat proteins) and lipophilic powders (e.g., cocoa powder), controls dust, and helps complete dispersion in water. Lecithin keeps cocoa and cocoa butter in a candy bar from separating. It can be used as a component of cooking sprays to prevent sticking and as a releasing agent. Lecithin is approved by the United States Food and Drug Administration for human consumption with the status "generally recognized as safe". Lecithin is admitted by the EU as a food additive, designated as E322. Because it contains phosphatidylcholines, lecithin is a source of choline, an essential nutrient. Clinical studies have shown benefit in acne, in improving liver function, and in lowering cholesterol, but older clinical studies in dementia and dyskinesias had found no benefit. However, a more recent double-blind, randomized, placebo-controlled trial in 2003 found that it was necessary to raise the lecithin dose to 1 gram and maintain daily supplementation for at least 90 days in order to see measurable benefits, which were confirmed in "all testing parameters." An earlier study using a small sample (20 men divided in 3 groups) did not detect statistically significant short term (2–4 weeks) effects on cholesterol in hyperlipidemic men. La Leche League recommends its use to prevent blocked or plugged milk ducts which can lead to mastitis in breastfeeding women. Egg-derived lecithin is not usually a concern for those allergic to eggs since commercially available egg lecithin is highly purified and devoid of allergy-causing egg proteins. Similarly, soy lecithin does not contain enough allergenic proteins for most people allergic to soy, although the US FDA only exempts a few soy lecithin products from its mandatory allergenic source labeling requirements. Soy-derived lecithin is considered by some to be kitniyot and prohibited on Passover for Ashkenazi Jews when many grain-based foods are forbidden, but not at other times. This does not necessarily affect Sephardi Jews, who do not have the same restrictions on rice and kitniyot during Pesach/Passover. Muslims are not forbidden to eat lecithin per se; however, since it may be derived from animal as well as plant sources, care must be taken to ensure this source is halal. Lecithin derived from plants and egg yolks is permissible, as is that derived from animals slaughtered according to the rules of dhabihah. The key companies operating in the global lecithin market include Archer Daniels Midland Company, Lipoid GmbH, Ruchi Soya Industries Ltd., Cargill Incorporated, Lasenor Emul S.L., Kewpie Corporation, E. I. du Pont de Nemours and Company, Aceitera General Deheza S.A., VAV Life Sciences Pvt. Ltd. and Sternchemie GmbH & Co. KG. Research suggests soy-derived lecithin has significant effects on lowering serum cholesterol and triglycerides, while increasing HDL ("good cholesterol") levels in the blood of rats. However, a growing body of evidence indicates lecithin is converted by gut bacteria into trimethylamine-N-oxide (TMAO), which is absorbed by the gut and may with time contribute to atherosclerosis and heart attacks. ^ Gobley, Theodore (1846). "Recherches chimiques sur le jaune d'œuf" [Chemical researches on egg yolk]. Journal de Pharmacie et de Chemie. 3rd series (in French). 9: 81–91. ^ Gobley, Theodore (1874). "Sur la lécithine et la cérébrine". Journal de Pharmacie et de Chimie. 4th series (in French). 19: 346–353. ^ What are the Uses of Lecithin in Food? ^ Zeisel SH; da Costa KA (November 2009). "Choline: an essential nutrient for public health". Nutrition Reviews. 67 (11): 615–23. doi:10.1111/j.1753-4887.2009.00246.x. PMC 2782876. PMID 19906248. ^ a b Staff, Alternative Medicine Review (2002) Phosphatidylcholine Altern Med Rev. 7(2):150-4. ^ Jackie Dial, PhD and Sandoval Melim, PhD, ND. June 2000, updated June 2003. "Lecithin" in AltMedDex® Evaluations. Truven Health Analytics. ^ De Jesus Moreno Moreno, Maria (January 2003). "Cognitive improvement in mild to moderate Alzheimer's dementia after treatment with the acetylcholine precursor choline alfoscerate: a multicenter, double-blind, randomized, placebo-controlled trial". Clinical Therapeutics. 25 (1): 178–193. doi:10.1016/s0149-2918(03)90023-3. ISSN 0149-2918. PMID 12637119. ^ Oosthuizen W, Vorster HH, Vermaak, WJ, et al. Lecithin has no effect on serum lipoprotein, plasma fibrinogen and macro molecular protein complex levels in hyperlipidaemic men in a double-blind controlled study. Eur J Clin Nutr. 1998;52:419-424. ^ "Soy Lecithin". Food Allergy Research and Resource Program. University of Nebraska–Lincoln. Retrieved 14 December 2018. ^ (Reb Yehonatan Levy, Shomer Kashrut Mashgiach - based upon halachic rulings of CRC - Chicago Rabbinic Council, and from shiurim/lessons by Rabbi D. Raccah on "Pesach Preparations" following commentary from former Rishon-LeTzion Rav Ovadia Yosef). OK Kosher Certification, Keeping Kosher for Pesach. Retrieved on September 10, 2008. ^ Islamic Food and Nutrition Council of America FAQ, IFANCA: Consumer FAQ. Retrieved on July 7, 2010. The practice of consuming Halal products is not widespread among Muslims, the practice is common with Muslims who follow Sharia laws. ^ "VAV Life Sciences launches India's first phospholipid manufacturing plant". Express Pharma. Retrieved January 31, 2017. ^ "Global Lecithin Market Size, Share, Development, Growth and Demand Forecast to 2020 - Industry Insights by Source (Soy, Egg, Sunflower and Others), Application (Food, Animal Feed, Nutrition and Health Supplements, Cosmetics, and Others)". Reportlinker. PRNewswire. Retrieved March 9, 2016. ^ Iwata T, Kimura Y, Tsutsumi K, Furukawa Y, Kimura S (February 1993). "The effect of various phospholipids on plasma lipoproteins and liver lipids in hypercholesterolemic rats". J. Nutr. Sci. Vitaminol. 39 (1): 63–71. doi:10.3177/jnsv.39.63. PMID 8509902. ^ Jimenez MA, Scarino ML, Vignolini F, Mengheri E (July 1990). "Evidence that polyunsaturated lecithin induces a reduction in plasma cholesterol level and favorable changes in lipoprotein composition in hypercholesterolemic rats". J. Nutr. 120 (7): 659–67. doi:10.1093/jn/120.7.659. PMID 2366101. ^ Tang, WH; Wang Z; Levison BS; Koeth RA; Britt EB; Fu X; Wu Y; Hazen SL (Apr 25, 2013). "Intestinal microbial metabolism of phosphatidylcholine and cardiovascular risk". N Engl J Med. 368 (17): 1575–84. doi:10.1056/NEJMoa1109400. PMC 3701945. PMID 23614584. ^ Mendelsohn, AR; Larrick JW (Jun 2013). "Dietary modification of the microbiome affects risk for cardiovascular disease". Rejuvenation Res. 16 (3): 241–4. doi:10.1089/rej.2013.1447. PMID 23656565. This page was last edited on 23 April 2019, at 11:25 (UTC).